"Lord protect us, Saints preserve us, We been drinkin’ Whiskey ‘fore breakfast"
Coins weren’t actually minted in Wyoming but many were in play during the heyday of gambling in the rear of The Mint Bar, in downtown Sheridan. Cowboys and girls had been known to duck under the front door on horseback. Teddy Roosevelt wrote of the “mad antics” he witnessed at the bar. Certainly, the chords and lyrics of Whiskey Before Breakfast have been played time and again in this classic Wyoming destination. Michael Blessing’s "Whiskey Before Breakfast" reveals a great deal about his concept of the Neon West. It is as much a state of mind as it is a visual record of its streets and history. 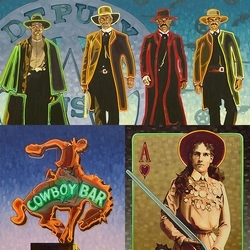 With "Neon Gunslingers" he takes western icons into the Pop Art realm of rarified gasses and with "Whiskey Before Breakfast" we see the rarified gas origins of Pop Art on the western landscape.